When I was in grade school, one of our art projects was to collect used wooden matches and then create geometric patterns with them, gluing them side by side on cardboard. It did create an interesting contrast between the burned and unburned ends of the matches, and I actually managed to create stepped patterns with the matches. HOWEVER, looking at this gorgeous object from the Micmac culture of the First Nations, I have no illusions about my future as a competent decorative artist. First Nation cultures are renowned for not wasting any part of animals that they hunt. To me one of the most fascinating art forms to come out of that practice is QUILLWORK. Unlike other Native arts—such as jewelry and weaving of the Navajo, the ledger painting of the Sioux, and the numerous types of trade art that rely on traditional forms—quillwork is one Native art form that has fallen into relative obscurity. Only recently has it been given renewed attention by several First Nation artists (Orvilla Longfox comes to mind). Quilling is an art form that has been done traditionally only by women. Porcupine quill work is one of the oldest aboriginal art forms. It is a time-consuming and multi-step process. First, the quills must be sorted according to size, cleaned, and dyed. In the traditional manner, the artist would draw the quills repeatedly through her teeth, making them supple. The quills, split in half down the middle, are then applied to the design. They can be arranged in zigzag pattern, plaited, parallel folded, banded, or woven. The Micmac (Mi'kmaq) arrived in eastern Canada from the north and west during prehistoric times (about 10,000 years ago). They are members of the Algonquis band of First Nations that includes the Abenaki, the Passamaquoddy, the Penobscot, and the Maliseet. They settled in villages along the Atlantic and inland rivers where they fished and hunted for subsistence. They have communities in New Brunswick, Nova Scotia, Prince Edward Island, Newfoundland, Labrador, and Maine. Like many native bands, the Micmac more or less gave up decorative quillwork with the advent of European glass beads. However, French Canadians called the Micmac “Porcupine Indians” because of their skill at quillwork. This beautiful container is a late example. The quills are set into the birch bark in zigzag patterns with a star pattern on the lid. Birch bark had many uses for the Micmac, including as a covering for their homes, covering on their canoes, and as “callers,” a conical device used for calling over long distances much like a modern megaphone. This website gives a lot of information about Native quillwork. Absolutely exquisite workmanship. I have seen similar quillwork objects in Northern Siberia but not as nice as this example. Considering you are not an expert on the subject your blog is both very interesting and has excellent information. Two points to note, however, The Mi'kmaq did not give up quillwork for beadwork. 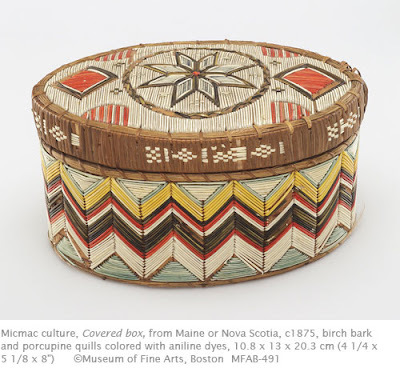 If you read Ruth Holmes Whitehead's "Micmac Quillwork" you would know that the Mi'kmaq quill boxes are a later invention. Although the Mi'kmaq probably did do some quilling on bark Nicholas Deny and Father Christian Leclerq who lived in the Gaspe region in the late 17th century describe primarily woven and embroidered quillwork sewn on leather or for hair and other ornaments. Wonderful examples of this type of work (though not Mi'kmaq) can be seen in Canadian Museum of Civilization's Speyer collection that was published in "Bojou Neejee" by Ted Brasser. Certainly I agree with you that the Mi'kmaq quillwork designs on bark containers and other objects are higly developed creations which have grown from Centuries of cultural evolution. Personally I am even more fascinated by the Wabanaki baskets(of which the Mi'kmaq are included) that even today are not made from supple weaving materials but by loosening the annual rings on a hard wood (ash tree); cutting and separating them into long splints; and splitting these splints into thinner and narrower splints sometimes as thin as paper depending on the quality of the wood. Although I have researched this art form for more than 20 years it still fascinates me as much as the technology that allows a hunk of heavy metal to lift off the ground under it's own steam. But what really keeps me reserching the subject is the endless designs and types of baskets invented by using only 4 construction elements. No other basket makers have been as creative in the quantity of basket types which I still continue to discover and yet like the quillwork using traditional patterns and designs in constantly innovative ways. Beautiful workmanship and design. Very inspiring. Thank you for posting. I think it a good one idea about aboriginal art teaching. Because it is much difficult to understand the exact meanings of lines, dots and painting in the aboriginal art. Through the proper education teachers can developed the more interest of students towards aboriginal art, and their understanding. you're just extremely wonderful. I actually like what you have got here, really like what you are saying and the way in which by which you assert it. You are making it entertaining and you still take care of to keep it smart. I can not wait to learn far more from you. This is really a terrific website. What are your thoughts on preserving the old porcupine quill boxes from mites?